This private Agra train trip is best suited for those who want to experience a journey on one of India's fastest trains. If you want to explore two UNESCO World Heritage Sites in one day, then this private Agra train trip is a perfect itinerary for you. In this private Agra train trip, you will visit the Taj Mahal, Agra Fort and Itimad-Ud-Daulah. Experience the journey on one of India's fastest train - Gatimaan Express. Visit three main Heritage Sites i.e. Taj Mahal, Agra Fort and Baby Taj. Capture the beauty of Taj Mahal while your guide assisting you in taking lifetime memorable photos. Our driver will pick you up from your hotel in Delhi at around 7 AM. Drive to Hazrat Nizamuddin railway station and board on the fastest train of India. Relax and enjoy the 90-minutes train journey and arrive at 09:50 AM in Agra. The breakfast is complimentary on the train. At around 09:50 AM, you will be at Agra Cantt railway station. Meet your private guide with your name sign and start your memorable day trip. The trip will start by visiting the Taj Mahal, the renowned and one of 7 wonders of the world. The beauty of this white marble mausoleum is absolutely breathtaking. Learn about the history and story of how and why it was built by Mughal Emperor Shah Jahan in the memory of his beloved wife Mumtaz Mahal. 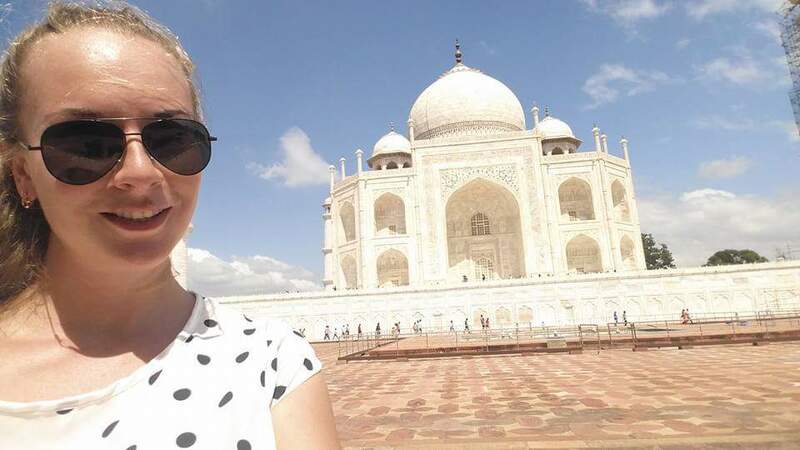 You can ask your guide to assist you in taking photos at the best places of Taj Mahal.When the Taj Mahal tour is done, we will visit the nearby Agra Fort. This place is another UNESCO World Heritage Site. The monument is built in red sandstone and was once the seat of Mughal Empire our guide will explain to you about the different buildings and places of the monument. The tour will be of around 45 minutes. After completing this second site, enjoy a lunch break at a multicuisine restaurant.After having lunch, we will visit Baby Taj or Itimad-Ud-Daulah, the first Mughal structure made from marble. As you explore the site, you can see the extensive use of Pietra Dura. Like Taj Mahal, this monument also sits on the banks of Yamuna River. After completing the day tour of Agra, start your return journey and reach Agra Cantt railway station. Board on the Gatimaan Express and arrive at Delhi at around 5:45 PM with on board food. Upon arrival, our driver will drop you at your desired location in Delhi by private car. Pick up and drop off from in Delhi. Standard Tickets of Gatimaan Express for the 2-way return journey. Breakfast and food on the train. Private tour guide for all the places. Sightseeing by a private car. All fees, tolls, fuel and taxes. Carry a valid Photo ID(passport/driving licence/student identity card) for all the passengers for the train journey. The pickup time from the airport is 6:30 AM to ensure that you can catch the train to Taj Mahal departing at 8 AM. You will return to Delhi airport or hotel at 8 PM.